So far Lynn has created 6 blog entries. April is a hot time to visit Mumbai but Ramanand, my guide, showed me that Mumbaikers like their lives to be hot on the inside too. 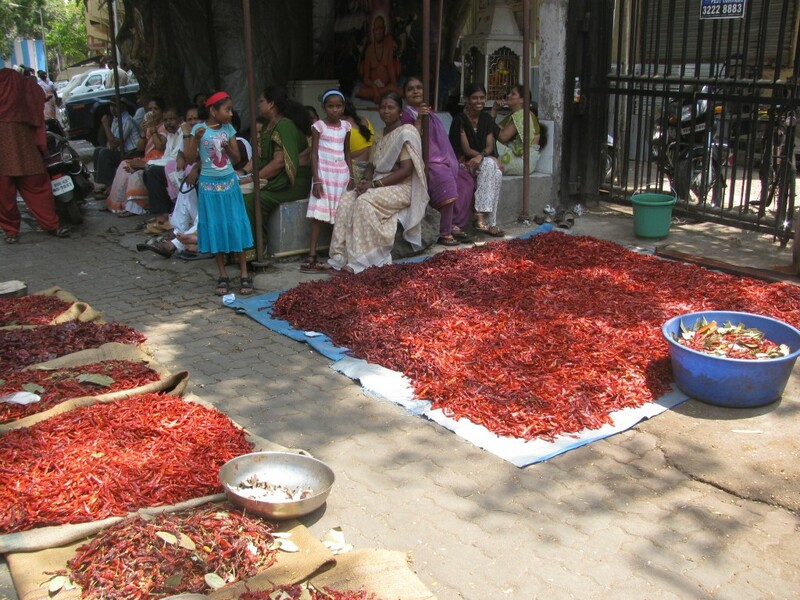 We wandered through Lalbag Masala Gully where I was surprised to see groups of ladies sitting in the shade with sacks laid out in front of them, piled high with red hot chillies. Some piles were large and Ram said this would belong to a bus load of ladies from a village, coming to the city to “stock up.” A girls’ day out, Indian style. 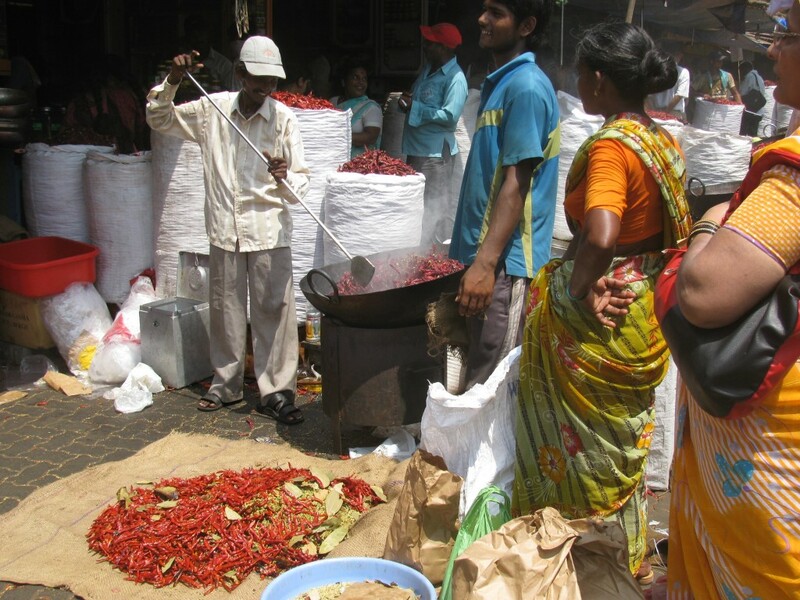 He explained they were waiting to have their own special combination of spices pounded into a year’s supply of “exclusive flavoured masala.” Basins full of peppercorns, cinnamon, cloves, cardamom and nutmeg lay beside them as they, and long lines of families, waited patiently for their turn to go forward. Large woks sizzled with the chillies and the pungent aroma bombarded the senses, made my eyes smart and brought tears to my eyes! 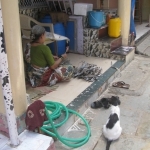 Barefoot men loaded the mixtures into machines which ground them down and filled plastic bags with the resulting powder. April is clearly the month of the chilli, wherever we went they were drying in the sun. 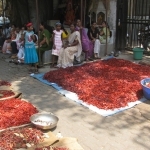 We moved on to visit the Sassoon docks and Koli village in Colaba. The 7 islands which make up modern Mumbai are the ancestral home of the Koli community, fishermen who fished as far away as Goa and Mangalore. 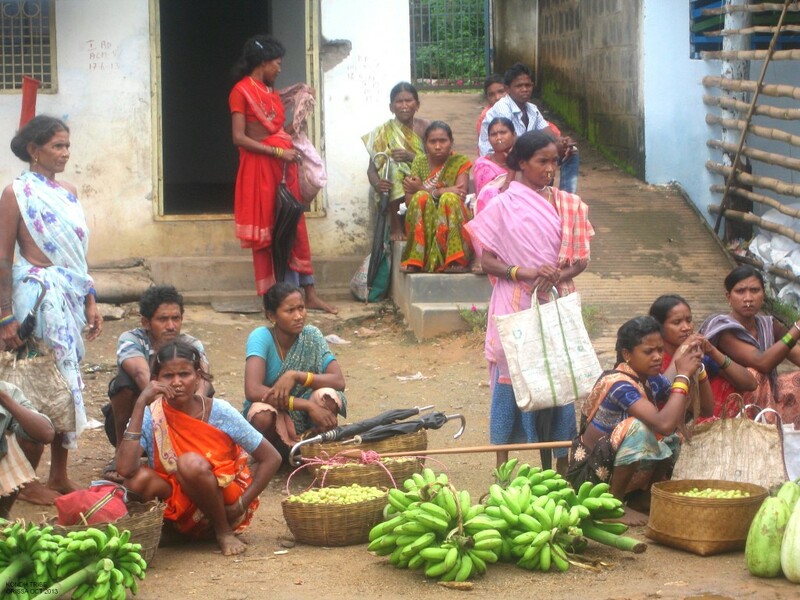 Slowly their culture is dying and this was an opportunity to get a glimpse of their lives. We arrived late in the morning so the main activity of the fish market was virtually over for the day with just a few latecomers unloading their fish. Ice was being emptied into the holds and fish thrown from man to man and finally on to the dockside. Ram interpreted for me as we chatted to a fisherman about the problems they encounter and how these mirror the reality in fishing communities in my home in the west coast of Scotland. Exploring their village later Ram soon had a group of childrensurrounding him as he did bird impressions and magic and the innocent pleasure was a delight to see, no ipads or iphones in sight! Life is simple and uncomplicated, undoubtedly hard but there were genuine smiles and contentment that is sometimes missing in our commercialised western lives. 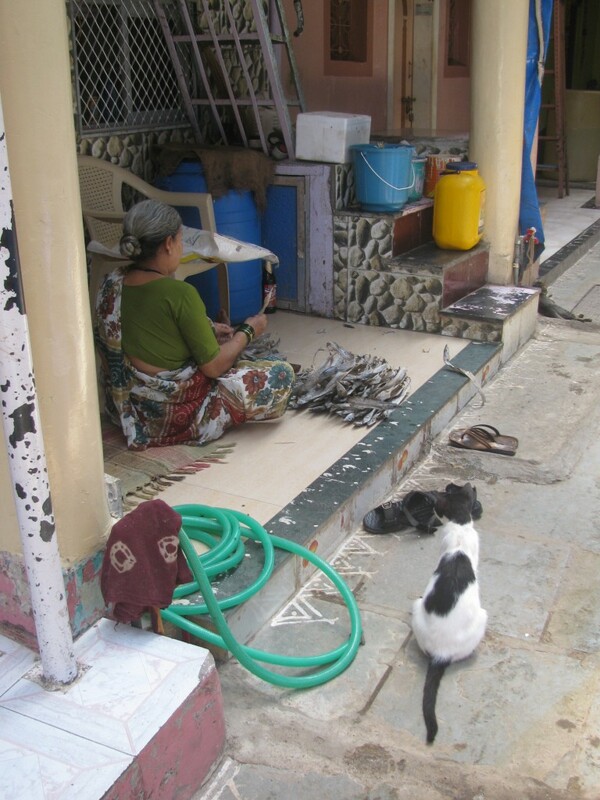 A cat sat patiently watching a lady sorting fish, ever hopeful of a titbit. 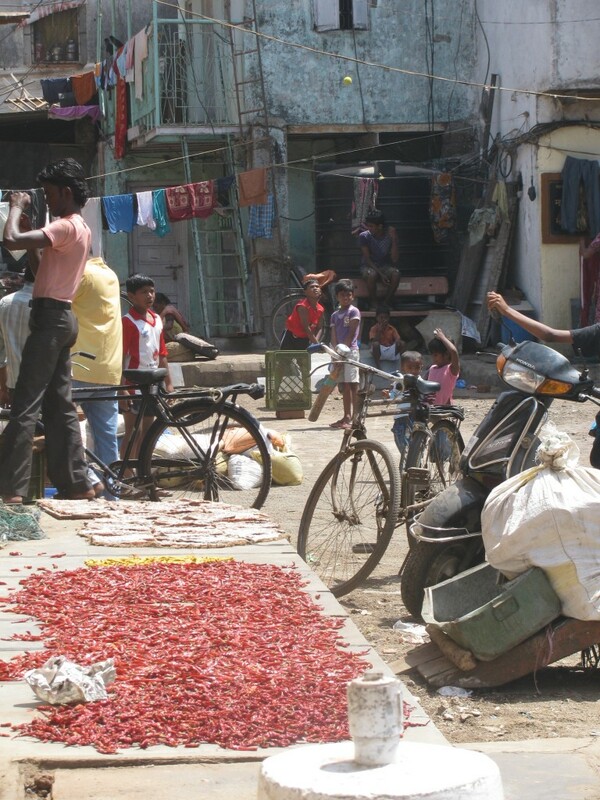 Walking through the village we saw the ubiquitous chillies spread on a step, alongside fish, drying in the sun. 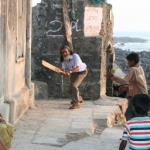 Children played cricket enthusiastically and it seemed to sum up the whole day; chillies, children and cricket. 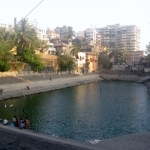 Ram and I ended our day at Banganga Tank on Malabar Hill, a quiet spot to watch the sun set over the sea. 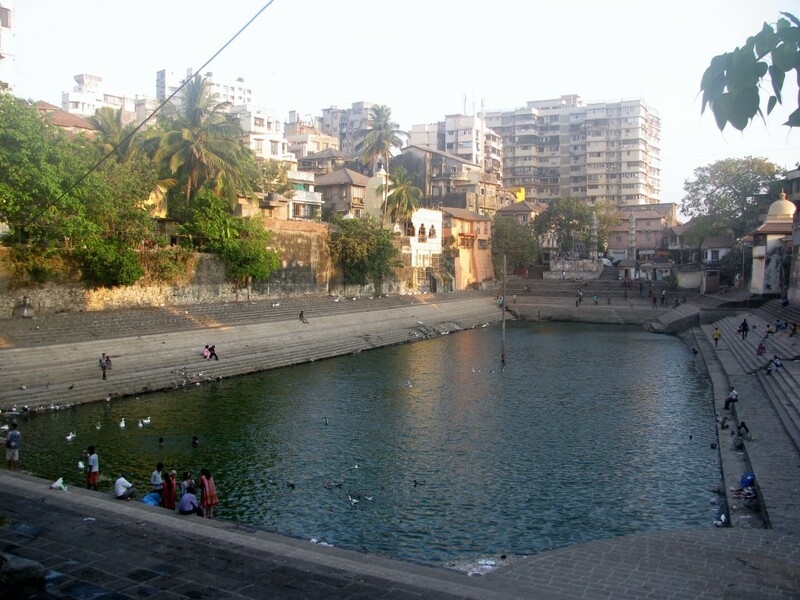 The ancient bathing tank is surrounded by Hindu temples and is a great spot to relax ..and chat with friends! 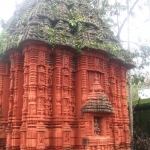 It was first constructed in 1127 and the wooden pole in the middle of the tank is symbolic of the centre of the earth where Lord Rama’s arrow pierced it. We walked to the end of the road and the rocky foreshore was busy with groups of boys playing cricket, using tyres for stumps..or so it looked to a non cricketing aficionado like myself! Ram couldn’t resist joining in and soon the pied piper had done it again with a posse of kids trailing in his wake. Mumbai, a city of colour and people. Put on your walking shoes and enjoying experiencing the city. 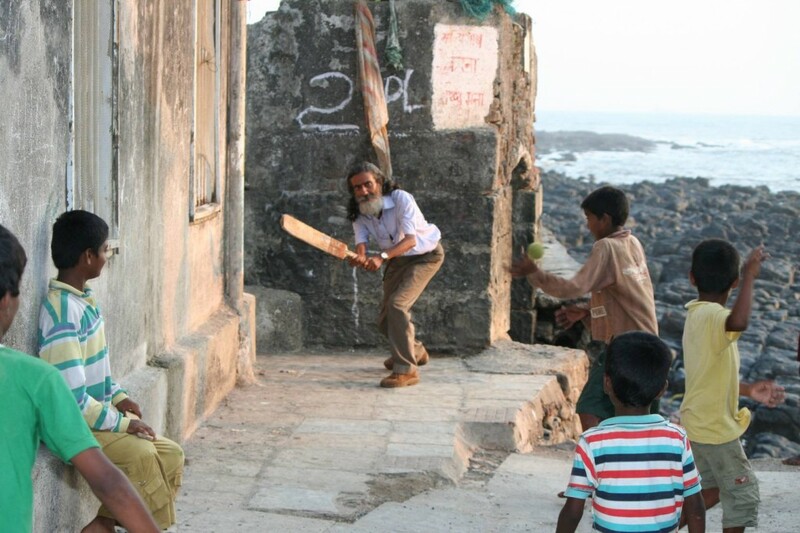 More than any other Indian city I have visited it is a place to go with the flow and people watch. While you are watching them…they will be watching you! Days after Cyclone Phailin struck the east coast of India and in particular Orissa/Odisha , we arrived in the area. We arrived into Vishakhapatnam early in the morning and prepared for our journey into the Wednesday weekly tribal market of the Gadabba and Kondh tribes. Through low cloud and torrential rain we were still able to appreciate some wonderful verdant countryside, the mountain ranges looming on the horizon. Once at the market we experienced many eyes staring at us, especially when we purchased some local sweets. Through sign language and the help of our guide, we ascertained that the tribal man who was signing to us had lost his teeth due to eating these sweets. They were incredibly hard but did soften up after a few days. The different tribes are distinguished from each other by their clothing and their piercings. However they were all fascinated by seeing “pale skin” tourists and welcomed us and encouraged us to purchase items from them.We were taken to a school and with the biscuits that we had bought, handed them out to the children. Each child came up tous, some with trepidation, to receive their “present”. No one ate the biscuit until every child had theirs and the teacher gave them permission to do so. It made us feel so humble to see what a simple biscuit meant to these children. We take so much for granted and then you are brought back to earth with an almighty bang, just to see the expression on the children’s faces to receive something that is an everyday item for us, but a luxury to them. The Thursday and Friday markets were similar to that on Wednesday but with different tribes and costumes, in fact we saw 5 different tribes at one of the markets which was brilliant. We visited other schools and different villages and saw the conditions that they live and work in. We learned about the marriage rituals, where the girls and boys are able to select their partners rather than having arranged marriages. 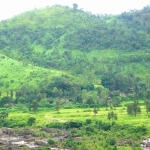 Our experience in these tribal areas was something that we had not felt in any other state of India and in a way we felt it was like living in a bygone age, without the pressure of life that we accept as “normal” now. 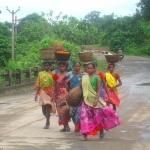 The state of Orissa is one of the poorest in India and I would recommend you visit it whilst it still maintains its unspoilt lifestyle. 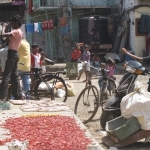 The countryside is magnificent and the markets and villages are so interesting and unspoilt. 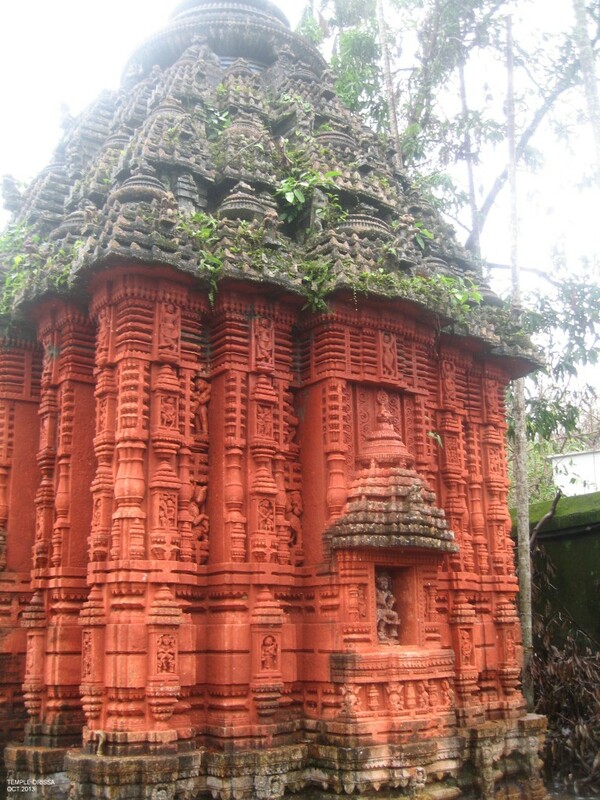 Combine these areas with the temple areas of Puri and Bhubaneswar for an experience not to be forgotten. A childhood ambition to collect a Kathmandu stamp in my passport drew me to Nepal this year. 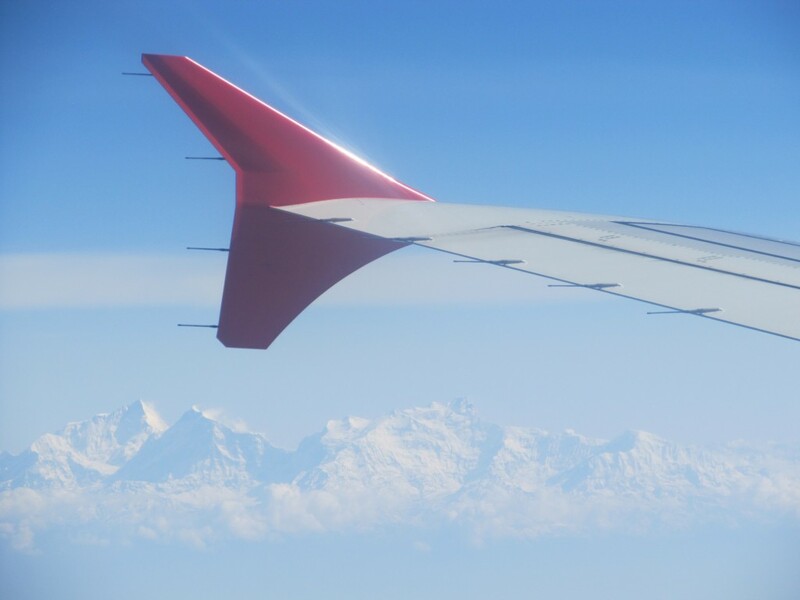 The thrill began on my Delhi flight when I first caught sight of the jagged outline of the snow – capped Himalaya on the horizon. As we descended, deepvalleys with roads zig zagging up their sides, terraced, golden harvested paddy fields and multicoloured, flat topped buildings of Kathmandu came into view. Like Delhi, the traffic from the airport was noisy and abundant, so the tranquility of Hotel Tibet International was welcome. It was within easy walking distance of my favourite spot, the magnificent Bodhnath stupa. Just as Agra is instantly identifiable with the Taj Mahal, so Bodhnath says “Kathmandu” (well, if you know Nepal!) As I wandered around the stupa it struck me that its “persona” changes with the time of day or weather, just like the Taj Mahal. Maybe, it’s something in the eyes. When the sun glinted off the gilded tower and the wind whipped up the strings of prayer flags, casting their mantras to heaven, the eyes seemed to have a benevolent air. But the following day when April storm clouds gathered, the Buddha’s eyes seemed to become more brooding. At night, from the roof top of one of the many small restaurants overlooking the stupa, the eyes watched protectively over the steady flow of pilgrims still circumnavigating the dome, lighting butter lamps and reciting prayers. 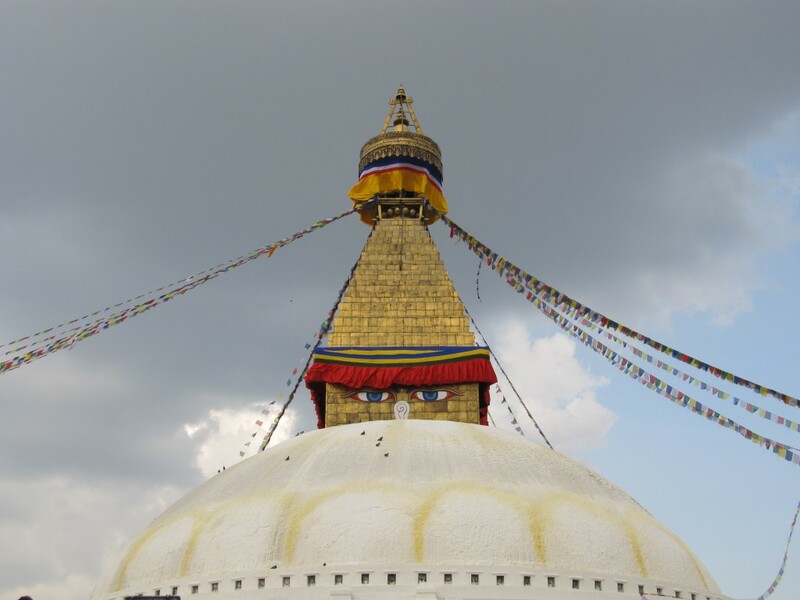 I revisited Boudha several times and each time there was something new to see. Old ladies dressed in traditional costume spinning the prayer wheels as they walked around the base of the stupa. Devotees prostrating themselves full length on the ground in the courtyard. Artists concentrating on intricate thangka, Tibetan religious paintings. Tiny shops selling Tibetan singing bowls, butter lamps, dramatic, vibrant papier-mache masks and all sorts of Buddhist paraphernalia. The perfect place to say a prayer and watch the world go by. 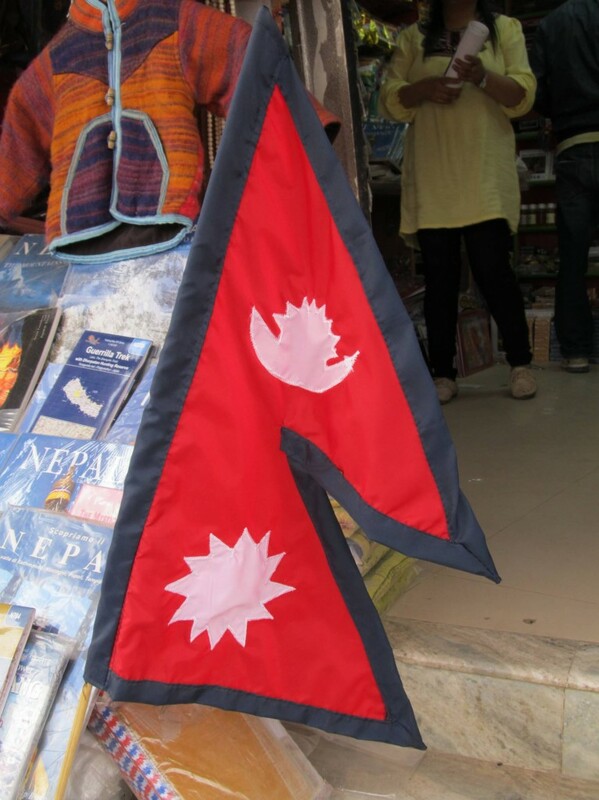 The national flag of Nepal is the only non – quadrilateral national flag in the world. Red represents the colour of the rhododendron, the national flower and the blue border represents peace. The sun and moon inside originally had human faces but they were deleted when the modern flag was introduced in 1962. Some experiences last forever in the memory and visiting Sarangkot, just outside Pokhara, a few hours drive west of Kathmandu, is one of them. The weather had been mixed and low clouds hung heavy over Phewa Tal, the lake in front of Fishtail Lodge where I was staying. At 5.30am there was already quite a crowd at the viewing point (I later discovered quieter spots with similarly jaw dropping views.) Chai was served as we all huddled in jackets and gazed out over sleeping Pokhara, lights twinkling in the early dawn. Hushed voices added to the feeling of an imminent divine revelation. It was strange, you knew behind the curtain of cloud some whopping big mountains lay but, apart from the odd tantalizing glimpse, they remained shrouded. As the sun broke through the clouds the Japanese tourists cheered and there was a frantic clicking of cameras. 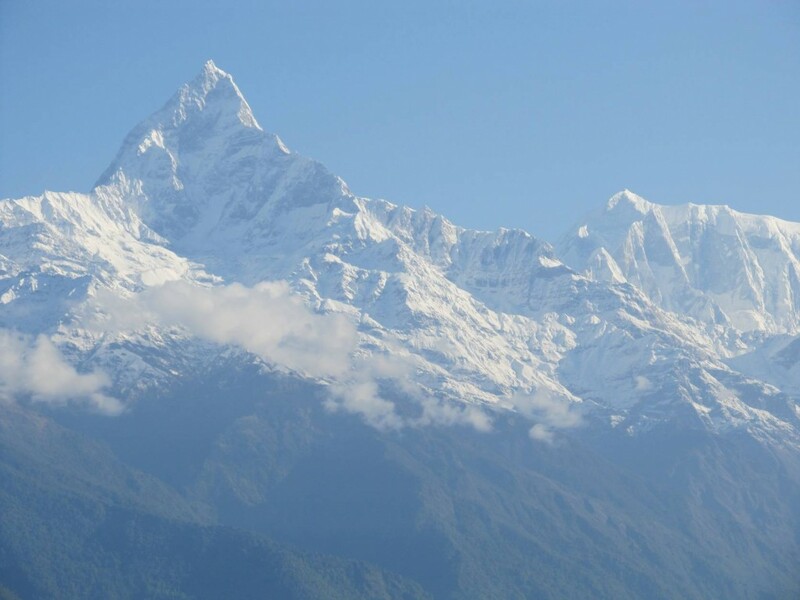 Fleeting glimpses of Machhapuchhare, Fish Tail mountain, but the pyramidal peak still remained elusive. People drifted away and apart from the odd microlight buzzing overhead all became peaceful. I was in no great rush to go and after an hour there was only a handful of camera/mountain enthusiasts left. Our patience was rewarded. The heat from the sun burned off the clouds and slowly, slowly more of the mountains were revealed, teasing us like some seductive mountain nymph. In some ways it made the revelation all the more inspiring. The Annapurna Himalaya lay in front of us; Dhaulagiri in the west, Machhapuchhare ahead and rounded Annapurna III hiding behind. Awesome! A word often used, but rarely more appropriately. 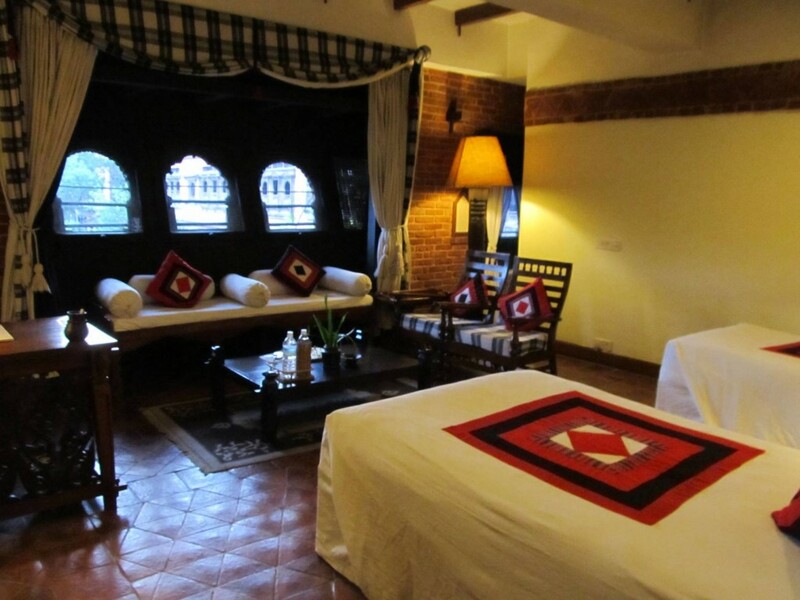 The owner has, over the years, salvaged thousands of woodcarvings and traditional Newari artefacts from condemned buildings to create this beautiful, romantic hotel. Each bedroom is unique, with colourful furnishings and plenty of space. At night the brick paved courtyards are lit by twinkling butter lamps and delicious traditional Nepali food is served in the Krishnarpan Restaurant. I recommend the 6 course special dinner, but skip lunch!